The Al Tahoe neighborhood is one of South Lake Tahoe’s most historic neighborhoods. The Al Tahoe area is one of South Lake Tahoe’s most diverse neighborhoods. Houses in the Al Tahoe neighborhood range from small rustic cabins built in the 1900’s, to million dollar lake front homes. There are also a variety of duplexes, triplexes, and small apartment buildings scattered throughout the area. Al Tahoe is located in the town center of South Lake Tahoe situated between Regan Beach and Highway 50. 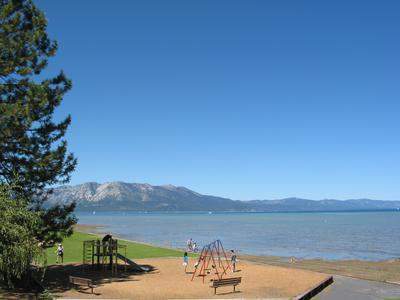 Regan Beach is just a short walk or bike ride from many of the Al Tahoe neighborhood homes. A wonderful place to picnic and see the fireworks on the lake. Lake Tahoe Activities close to the Al Tahoe area include Heavenly Ski Resort, the Stateline Casinos, and the El Dorado Beach Recreation Area. Al Tahoe’s central location, makes it a perfect area for either a vacation house or a primary home close to the blue water of Lake Tahoe. Most of the houses in the Al Tahoe area are built on smaller lots, but there are some homes on double lots. Lakeview Ave is on the north edge of Al Tahoe and parallels the Lake. Lakeview Ave is where you will find the lakefront and lakeview homes. Bellevue and El Dorado streets boarder the south and west side of Al Tahoe, and overlook the Truckee Marsh Meadow and Trout Creek. Many of the houses overlooking the meadow have amazing mountain and meadow views.